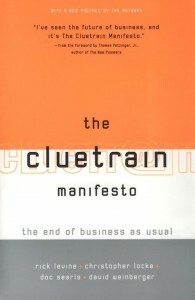 I was at Back Bay Station, waiting for the train to NYC when I noticed a young guy with the Cluetrain Manifesto in his hands. I couldn’t resist asking him of he liked it. “It’s old, but it’s great,” he responded enthusiastically, adding that the authors should give it a new title: “Welcome to the Social Web.” “It would be a bestseller,” he concluded peremptorily. He didn’t ask me if I even knew about it. At least, I thought, he isn’t one of the numerous entrepreneurs to whom I have to explain that a ten-year old book can still be a must-read. The train entered the station and we parted ways. I loved the book when it came out. A few things annoyed me back then, especially the rhetorical artifice of numbering the key messages after Luther’s 95 theses, a cultural reference that I knew from the history books, but was not part of my intellectual makeup. Why associate a fundamental societal evolution, I wondered, with a religious movement – however transformative it may have been? The idea sounded to me like a positioning trick that was ultimately weakening a powerful vision – I should say the strong “claim” that the Web is the property of the people. Incidentally, I forgot about my reticence when I later discovered John Dvorak’s scathing critique in PC Magazine, stating that it was “an odd vision of an idealistic human-oriented internetworked new world/new economy [marching] forward.” Dvorak wrote this in 2002, just before the emergence of the social networks that are now part of our lives: Friendster and Meetup were created in 2002, MySpace, Linkedin, Rize, and many others in 2003, and Facebook was to receive its first investment from Peter Thiel, the co-founder of Paypal (June 2004). Sometimes even great minds miss the train, and yes, we are in a “human-oriented internetworked new world/new economy.” Maybe not quite the way the authors anticipated it, as they could not really factor in the notion of social networks, but it’s true that markets are conversations, and that even though not all conversations are markets, something that the Cluetrain Manifesto does not say, it’s also clear that conversations are the bedrock of multiple markets – providing this invaluable “data” that all the Web estancias want to leverage to better target customers. As this young entrepreneur was telling me that the Cluetrain Manifesto should be renamed, I realized that I would like to have a sequel of sorts to that book, focusing on the economic rules that govern social living on the Internet from the user’s standpoint– in other terms, a “socialnomics.” Erik Qualman with Socialnomics, an interesting book about which I wrote a post in September, is actually one of the few authors who has tried to tackle the topic. People contribute to the Web, and get back a lot from it. Could they get more? Qualman shows “how customers [could] get paid for their search efforts,” comparing the current search model with a socialnomic model. A few companies have tried to look into this early on (especially All-Advantage, in 1999 and whose slogan was “Get Paid to Surf the Web”). The most recent and prominent is Microsoft, by offering its Live Search Cashback in 2008 and its Bing model this year. As people feed search engines, a real fast and cheap – even free – Internet to users should also be on the table: that’s what Google is doing by subsidizing free wireless network access in 47 airports until January 15. But why not longer and everywhere? No matter how loud we claim to live in a world of free and how passionately pundits try to forget about the wallet of the average Joe, Web usage remains costly – yet, all the Web estancias do need the average Joes to keep on searching, bookmarking, surfing and talking! Marylene, there is a sequel to Cluetrain: the 10th Anniversary Edition, with seven new chapters, including at least one each by all four original authors. I also just put up a long post providing some background about where I’m at now (not speaking for the other authors here). I think you’ll find it aggreeable. Thanks, Doc. You give me an excellent reason to write another post about a great book!